The Traveling Tripod: Float like a butterfly...flip like a coin...it's ZERO-G. Float like a butterfly...flip like a coin...it's ZERO-G.
"Ladies and gentlemen, this flight is about to begin. Please UN-buckle your seat belts and proceed to float about the cabin." You've no doubt watched with amusement when astronauts floated across the screen of your TV set. If you've dreamed about what it would be like to float effortlessly in space, now it's time to stop dreaming. This is adventure travel like no other. 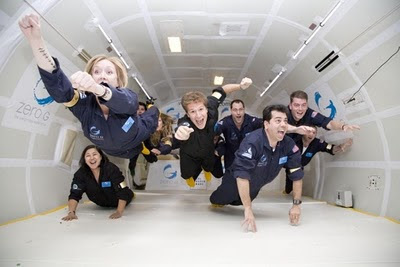 Zero Gravity Corporation (ZERO-G) is offering rides in its G-FORCE ONE aircraft, specially designed and outfitted to recreate the actual weightless experience. Not a ride simulator, this is the actual weightless experience encountered by the astronauts. This plane can duplicate the same levels of weightlessness enjoyed on Mars (1/3-gravity), the moon (1/6-gravity), and zero gravity. ZERO-G first began offering weightless rides in 2004 and has already flown 6,000 passengers for the thrill of a lifetime. From rock stars to movie stars, people of all ages (from 8 to 93) have declared it the most incredible thing they've ever done. The flight lasts two hours and affords 15 separate weightless sessions, each about 30 seconds in length.